Back home, Earth had gone through an impact-coalesce cycle only once. Since then, its core has been 84% iron, 6% nickel and the rest being labeled by The Encyclopedia of Earth: A Complete Visual Guide as "Other". How would this difference affect Earth's overall chemistry? Metal, which is dense so it sank to the bottom. This is the core. Rock, which is less dense than metal, so it remained at the top. This is the mantle, which then subsequently differentiated into crust and mantle, but that's not important for now. What are the "metal" and "rock" made of? The metal is mostly metallic iron and nickel, it is possible there are other lighter elements in there, but they are probably negligible and do not exert control on the chemistry. The rock are silicates: Basically magnesium, calcium, aluminium, iron, bonded to chains of silicon oxide. You can see why "rock" is less dense than "metal": it has lots of silicon and oxygen which are very light elements. Notice something interesting: the "rock" also has iron. Why is this iron in the "rock" and not in the "metal"? The answer is oxygen. Earth has a bulk chemical composition - it has a fixed amount of elements: iron, magnesium, silicon, etc., and most importantly oxygen. Oxygen is, well, an oxidiser. It will want to bond to other elements. When elements are bonded to oxygen, they start behaving like "rock" and not like "metal". However, certain elements will want to bond to oxygen more, quicker, easier, than other elements. Out of the major elements that exist in the Earth, Si, Mg, Al, and Ca really love oxygen. Fe and Ni less so, but they will bond to it if it's around. Turns out that the amount of oxygen in the Earth was enough to bond all Si, Mg, Al, and Ca and make them into "rock". A little was leftover to bond to some Fe and make it into "rock" as well. The metallic Fe (and Ni) is basically the leftover of this oxidation. Because they had no oxygen to bond with, they remained as "metal", thus forming the core. Good, now what does it mean for the minor and trace elements? Note that I'm not using the term "heavy metals" here, because it's a loosely defined term. For example, the list in your link includes titanium, whereas most people in the alloy industry will consider it very light. Instead, I'm using the term "minor and trace" to refer to anything that's not Ca, Si, Mg, Fe, O, Al, etc. Atmosphile (mostly gas, not relevant now). From the relevant Wikipedia page. So even though thorium and uranium, for example, are very heavy, they will partition to the mantle and not much is in the core. Cobalt is relatively light, but it will go to the dense core. This is one of the reasons why there is so little gold and platinum in Earth's crust - it's all locked up in the core, far away from our reach. They are in the core not because they are dense and sink. There is too little gold and platinum for them to significantly affect the density of the metallic "blob" we call the core. They are in the core because they really like being in molten iron-rich metal (which happens to sink because it is dense). Likewise, thorium really loves being around silicon and oxygen, and the oxygen is in the mantle "rock". 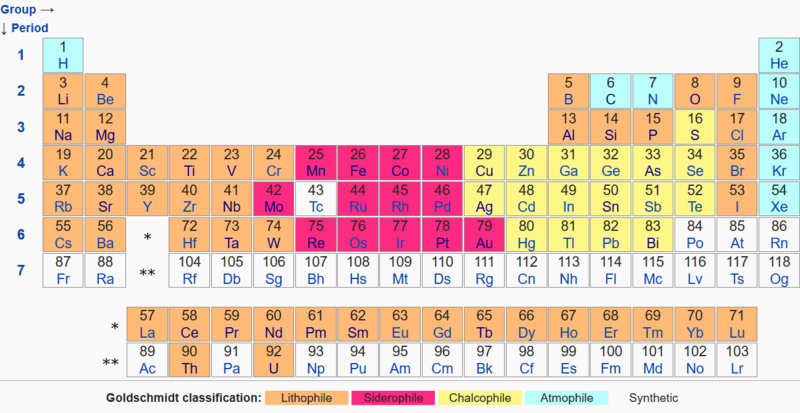 This is why it's not in the core despite it being one of the most heavy/dense metals in existence. Now here's the thing - the Earth is already differentiated. Melting the entire thing again will not actually do anything. The gold is already in the core, and the thorium is already in the mantle. Here's an example: take some ice and solid vegetable oil, crush them to small flakes and mix together. Now put them in the sun for a bit. The now-liquid ice and oil will separate, oil on top of water. If you add in a bit of oil soluble and water soluble (e.g. salt) materials, they will partition to their respective phases (i.e. water or oil). Now put it in the freezer again. And take it out again. Not much will change. This is how the Earth will be. But there's one very important exception!! After the Earth differentiated to core and mantle, and while the mantle was still molten, impacts of asteroids delivered additional material to the Earth, in a pre-differentiation composition. Thus, even though all the initial precious metals were locked in the core, we got more stuff. And because all the metal is now thousands of kilometres deep, it cannot access the new precious metals that were acquired. Melting everything all over again might result in some of the late veneer material, the precious metals, to be lost to the core again. But only if it can get into contact, or there are convective forces in the mantle to mix it, or it's happening for long enough for the elements to diffuse it. But since you're suggesting impact events, I don't see a reason why this can't happen. We will lose some amount or all of our precious metals. Not the answer you're looking for? Browse other questions tagged hard-science geology metals alternate-earth or ask your own question. All the Radioactive Metals Inside Earth's Core--How Would They Affect Convection? Can A Theia-Like Object Make Earth Richer? Would it ever be possible to access the vast supply of metal at the Earth's molten core? The Earth's core consumes a human? Could we reach the earth's core using today's nuclear arsenal? What would happen if we sped up the rotation of the Earth's core? How might the cooling of the Earth's core be accelerated? If a Mount Everest-sized mountain had Earth's sea level atmospheric pressure at the top, what would the atmospheric pressure be at sea level?